When an artist lives with a painting for awhile, the art will nearly always reveal its weaknesses. I recently announced I had finished a new painting, “Beach Enterprise”, and added it to my website, social media, email newsletter, etc. Afterward I left it sitting on the easel in my living room for about ten days and found myself looking at it several times a day with a critical eye. There were some things about the painting that just didn’t satisfy me. As I continued looking at it, I was concerned that Sam looked too flat. I didn’t like the color of his T-shirt. His left leg didn’t appear to be far enough behind his right leg, and his elbow wasn’t quite right either. Finally, it didn’t seem like his hair had enough contrast. What I really liked was the water–the splashes, the little wave, the transparency in the foreground, and the reflections below the figure. I’ve also struggled in the past to find the right pastel colors to render our northwestern sea accurately. 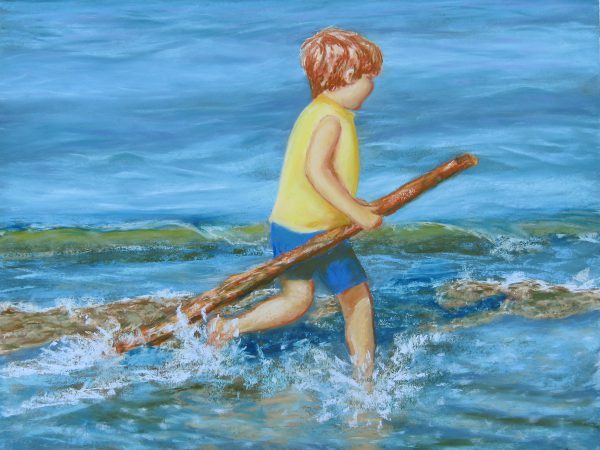 Besides buying new sticks of blue and green pastels, I recently watched an online workshop by pastelist Liz Haywood-Sullivan about the techniques she uses for painting ocean waves. It was incredibly helpful to me in this painting. I couldn’t leave the painting the way it was. I picked up my pastels and went to work on the problem areas. I’m much happier now with the results, and I hope you enjoy this painting, too. Click here to learn more about this painting or check its availability for sale. Filed under Blog. 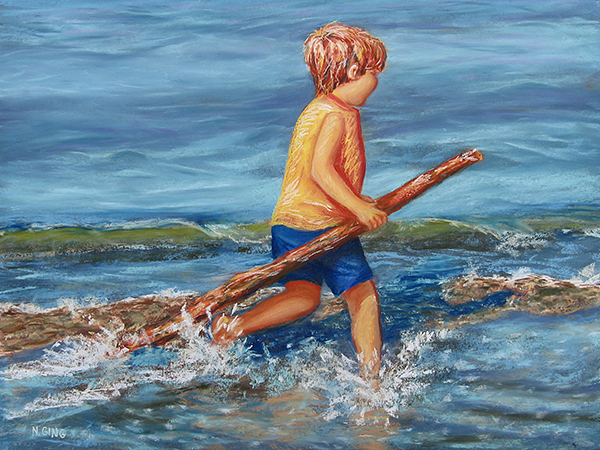 Tagged art process, figures, Pacific Northwest, painting process, pastel paintings, seascape, soft pastels.